It's that time of year again, folks! That time all of the retail world straps on their Santa hats and fires up their cash registers! Doorbusters, jingle bells and all that jazz! At The Comic Bug, we do things just a little differently! Inspired by online stores' "Lightning Deals", we invented BLACK LIGHTNING FRIDAY, named after one of our favorite heroes. It'll be going down at BOTH LOCATIONS (there's even something in it for you if you go to both spots! 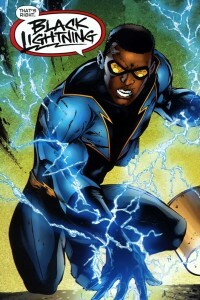 ), every two hours, we'll announce a new BLACK LIGHTNING sale! *EVERY VARIANT COVER IN THE STORE FOR COVER PRICE! *HALF OFF ALL NEW COMICS! *75% OFF ALL BACK ISSUES! *Buy one TP, get 10% off, buy two, get 20% off! Buy 5 TPs and get 50% off all five of them!! *90% off our SALE items! RSVP here, follow us on facebook and/or twitter and pounce on the deals all day long! See you here! And there!! !